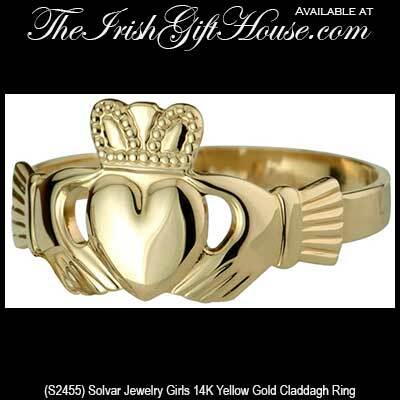 This smaller Claddagh ring is cast in 14K yellow gold and features a puffed heart along with a hollow back, (see the images for more detail) and measures 5/16" tall from the top of the crown to the bottom of the heart. The hollow back Claddagh ring has less gold where it is not necessary, but maintains a solid shank. The result is more ring for less money. 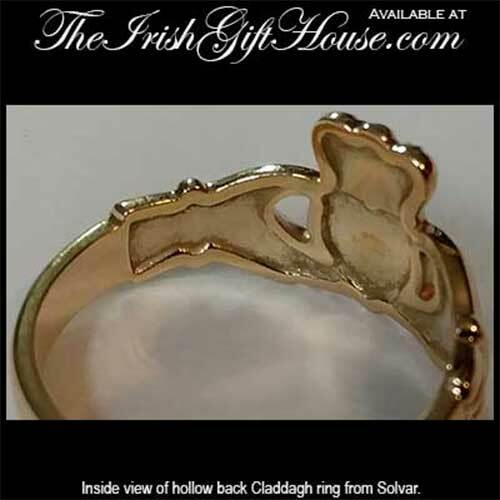 This 14K yellow gold Claddagh ring is made by Solvar Jewelry in Dublin, Ireland and it is gift boxed with a Galway Folklore card that explains how to correctly wear the Irish ring along with a Claddagh history card that is complements of The Irish Gift House.